Final Justice,in the U.S.District Federal Ct.against 12 state worker(s)supervisors et;al. during such time in 2013-2015 . . .
an astute "rare" civil rights advocate-expert in such pro-se lawsuit field,self file. A "true"ACTION-VISIONARY 1 of a kind Woman procuring her law degree in due course after law school and the founder, of the nation's already verified 1st law student,pro-se self file lawsuit pro-se consulting POWERFUL astute"unique" women clinic of its kind.. Such excerpt below is directly taken from her book/film/documentary on such horror turning into TRIUMPH after TORTURE for almost 8 years.Bella has proven when your applying"proper"action you shall not FALTER.She sued...PRO-SE SELF FILE and won right to move forward recent for her $ 50 MILLION suit along with daughter(s)in federal court. 100% PRO-SE SELF FILE CHAMPION. Such odds against her was clear to coward-lawyers who did not sue as documented called up to and between 118 in one year to in totality 350+lawyers,local/state/national. Bella, quite rapidly had learn what she needed to do.and she did just that. . . Now seeking her law degree. damages $$$ for each year in totality EIGHT years almost, that 2 suburban little beautiful girls,were tortured, taken, legally kidnapped, as such bias state workers at cps,a judge rubber stamp it all premise on thinking CPS was being truthful. State workers lied as far as APPEAL COURT,at each turn. Federal court now sees/hears/viewed/listen and is doing what is right,as MEDIA validate. "No lawyer file her lawsuit"for $50 Million"and she still won right to move forward from 1ST inception...No backing away from holding CPS accountable,shall get you to "where"you need to be." YOU DECIDE. YOUR CHOICE. From as far as LONDON/AUSTRALIA and on facebook under SUE CPS by deadline, she continue to receive so much support,for her girls severe torture both have suffered,and herself for so many years. WE THANK YOU ALL. while bringing "factual truth'and weekly awareness"to those who still have yet to realize,YOU are able to sue. BY DEADLINE CPS, so do not believe those who have not 1. )sued or those who 2. )do not have expertise in winning as our founder has, and or 3. )a "lawyer"whose clearly ignoring your calls,your injury, your child injury,as such indolent lawyer simply just don't care. When you'r realizing the aforesaid, you're going to apply your self in proper position and do as our founder has done,and study, learn, validate, then call in for her directly at extension 806 to learn more. "Your not able to file your suit against a dyfs worker"DHS can't be sued. TRUE INSPIRATION FROM ALL WALKS OF LIFE,even a former female judge in New York City/NJ tri-state,who commend her regularly on accomplishing so much,and now giving back by being there for those in L.A. to N.Y.C.WASHINGTON TO N.C.,S.C.,Texas to Oregon,Pennsylvania whose"truly"being violated by ahorrent CPS. Time to watch Blue Clues on Nickelodeon their favorite,encompassing with making sure breakfast is prepared for the girls. Mom about to head to the office(Real Estate)to handle her business as always. Mom later will be driving into nyc, the studio DOMINICANA Pink Diamondz Records, en nueva york and work out today. Typical 4th of july weekend,where this time the grandmother however, (ex spouse kevin's mother called to see if the girls can be over earlier than usual. GIA -N- TIA, only 7 and 10 were informed that it was ok to tell the grandmother that they will be over earlier this weekend for the holiday routine visit. Your day is so far, going well. Nothing indicative of entering a nightmare, that a reasonable sound mind person in life would not dare to do to two little healthy girls and loving suburban good mom. You are now preparing to drive to the"drop off spot" via court ordered as always just a day earlier,for the holiday weekend. To buy a happy meal and a toy at BK or Taco Bell as the girls love so much on the way to dad's residence and or your ex partner residence,for the typical routine court ordered visit. You arrived by noon, or a little bit after to the drop-off location, in this case grandma house, in plainfield. You kiss "goodbye"to your little ones,hugging tightly with smiles throughout. You hear your lil one only 7 years old say, ok bye bye mommie, we see you on Sunday! (smiles entire time as she wave goodbye, her little feet walking up the stairs,as grandmother await their arrival." The older girl says i love you mommie. Never to imagine your child(ren)will be kidnapped/removed from your home, without word or warning . CHILD PROTECTION SERVICES. . .
YOU'RE DOING YOUR WORK. YOUR MUSIC. WORKING OUT. RELAXING WHILE THE GIRLS﻿ ARE "SAFE"﻿away from your home. Afterward, on sunday you're going food shopping so there is food in the house as always when your girls return from the court-ordered visit. Your buying as always healthy foods for you and your children encompassing some of the girls favorite treats. Never would believe a tragedy is about to arise that was a " intentional state-related tragedy." Several days go by and the child is not yet produced by the ex spouse. DCF,DHS,DYFS,DCPP-CPS knew the entire time along with your ex. YOUR CHILD WILL NOT BE RETURNING HOME. DYFS (now called DCPP) prior also called "DCF" remove a little girl & her younger health un-abused sister from their loving 1 family home, of a doting loving mom, from july 3rd, 4th, 5, 6,7,8,9, 10,11, 12,13, 14,15,16 without the necessary court order,in violation as case law wholly undisputedly support "the necessary court judicial order,that is necessary if you're planning to keep a child away from their parent,under state seizure et.al,"
Reports of such factual dissemination of report(s)medical et.al, altered by C.P.S. Accounts from expert(s) from california where owner has family to here in NYC/NJ and North Carolina, Maryland, other states also from Civil Right Lawyers,as well." Video-Footage- photos et.al, all shall support the length a caseworker et.al, actually several conspired to deprive three innocent good souls,of their united states constitutional rights. Such video-documentary exhibit not hearsay but actual real event(s) + images that were never seen prior to the parent's botched and mockery of a trial experts agree,"that should have NEVER even made it to the front of the courthouse steps, let alone a four month fact-finding trial." You're now reaching the actual conclusion of such book and docu-series excerpt(if you're wanting a proof-copy et.al, be sure to mention during our staff virtual online office staff free call in today. )When you're calling in, ask for owner ext. 806 Ms.Melendez to learn more,and how you're able to take part in such true-story, docu-series. 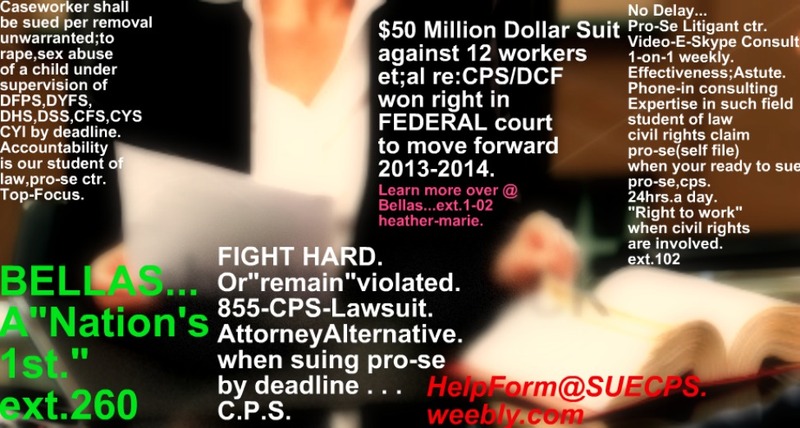 Remember everyone, If you're suing CPS worker(s)we commend you. Do not believe just because a caring astute lawyer is not representing you, as the owner knew that if she"sat online"waiting day in day out for one california to nyc,nj nationwide civil rights lawyer to care and sue for her,that she will miss her deadilne... She was smarter than that and her family took such prerequisite action in a timely-fashion, to at the least commence such warranted damages civil right lawsuit, while continually searching for the"right lawyer to come on board." This way, her family deadline as you are already noticing,was not missed so the U.S.DISTRICT FEDERAL COURT SHALL BE ABLE TO GIVE FULL FAIR FEDERAL COURT CONSIDERATION FOR DAMAGES." Inspiration or many as she refuse to "sit online and just bemoan about the issues involving her daughter's cps kidnapping." NO EVIDENCE TO VALIDATE,BUT YET YOUR LOSING CUSTODY.FILE SUIT. TIME IS QUITE LIMITED TO SUIT,PRO-SE SELF FILE IN THE U.S.DISTRICT FEDERAL COURT. Your child goes from being a playful,happy astute,happy-go-lucky child while in YOUR primary care. 1. )Become more docile(while in state care and supervision)to make child "appear"to be just"fine." 2. )Become a clear-danger to himself/herself. 3. )Becoming suicidal-and or have become more distant from her once happy life,in school,with her peers,and others. The one thing the owner @ WON NETWORK- have learn is that Life is too short NOT to sue cps and hold em'accountable. Inspiration for many weekly who are intending on and or already have sued nationwide. "The time is always right, to do what is right.." MARTIN LUTHER KING JR.